How do you stay healthy and fit? Alina Cincan shares her experience. Welcome back the series that started in 2014! Indeed, a lot has changed since then. I finally managed to put on some weight and become stronger. As for Alina Cincan, the changes were quite opposite, but the result is the same - better health, more confidence and enhanced wellbeing. So I am giving the floor to Alina now. Let's see what she has to share and what changes occurred in her life since 2014. We decided not to change the original post written two years ago, but to add updates for each section. Please let us know in comments what you think! Hmmm… I was quite reluctant when I was invited to take part in the series, as I may not be the best example there is. However, reading similar experiences has helped. OK, I’ll start with the negative bit: since moving to the UK, I have put on weight, especially after quitting my teaching job, which meant I went from moving around the room a lot to sitting on a chair in front of the computer for more hours than I’d like to count. However, this post is not about this, but how to keep health and fit in a job like ours, which has us in a chair for the most part of the day. UPDATE: It seems I may have something to say after all. Since I wrote the lines above, I have lost more than 20 kg. I still spend a lot of time in front of the computer though. I am afraid there isn’t much I can do about it. I have been eating mostly healthily for many years. I never eat fried food (except the odd fish and chips, I mean, c’mon, I live in the UK, it’s a given) or overly processed foods. Having a sweet tooth doesn’t always help, and if will power is not enough to keep my cravings at bay, I go for some raw almonds with a bit of honey (calorific, I know, but healthier than a croissant) or, if I’m really good, a piece of fruit. I don’t want to get into the subject of nutrition and healthy eating, first of all because I am not qualified and secondly, we are all different and what works for one will not necessarily work for another. UPDATE: It’s been a year now since I embarked on a diet – Dukan. Please rest assured I had done my research before choosing it; I had read a lot, both about its advantages and its disadvantages, and after careful consideration, I decided it was right for me. It may not be for everyone, but it worked for me. My main meals now consist of lean meat and veggies. I also eat a bit of bread (always wholemeal rye type) and fruit. I’d say it’s pretty healthy, right? Before coming to the UK, while I wasn’t necessarily a sports fanatic, I did go to the gym (sometimes regularly, sometimes not). That didn’t really change here until recently. Some while ago, I took up jogging. If during the first days (who am I kidding, more than a few days), all I could manage were a couple of minutes of running before running out of steam and having my tongue lolling and me panting like a dog. However, I did not give up and after a couple of months I was actually pretty good (I managed to jog for about an hour – my partner was wondering if I was preparing for a marathon or something). Jogging, like Sara Colombo would probably tell you, is not that difficult to fit into your daily schedule. I stopped jogging when I started teaching quite far from where I lived, when after commuting 2 hours one way and 2 more back home, jogging was at the bottom (pun intended!) of my priority list. I had started running again last year just before work, but a sudden back pain prevented me from continuing. But I took up tennis. My partner and I bought the necessary equipment and started playing on a tennis court not far from where we live. It’s fun (although I lose every single time) and keeps us active. For the last 5 months or so, I managed to get into a routine. I go to the gym 7 days a week (I started with 3 times a week, then increased gradually), in the evening during weekdays and in the morning at the weekend. This gives me a lot of energy, especially after I come back and have a shower, I feel like I can take on the world. UPDATE: I no longer go to the gym, but I exercise daily: walking, squats, plank, crunches, yoga, whatever I can fit in my schedule, or whatever I feel like doing. The main thing is to do something. - Breaks: Having a break every hour or so helps, even if it’s a short one (drink a glass of water, stretch, just stand for a couple of minutes…). I was even considering a standing desk, but it seems it may not be the best idea. - Read: Reading is one of my biggest passions and it keeps my brain healthy, as it helps me unwind and relax. I read every single day, usually before I go to bed during the week and more at weekends. Again, thank you, Olga, for inviting me to take part in the series and I hope at least a few people will find my experience and tips useful. Note: The first version of the post was written in 2014, while the updates in 2016. Dear Alina, many thanks for this wonderful interview and all the updates! It's very encouraging. Wishing you all the very best in your life and work! 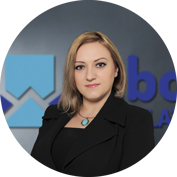 Alina Cincan is a translator and interpreter with over 10 years’ experience, now Managing Director at Inbox Translation; she also speaks at industry events and conferences. She is a language geek who likes to keep up to date with what’s happening in the industry. When not writing on the company’s award-winning blog – Closer Wor(l)ds, she is writing on other people’s. She also has a soft spot for sushi, make-up, shoes and owls. You can get in touch on Twitter, Google+ and LinkedIn.